Sage the Barista Express Review - Coffee Shop Taste in Your Home? The Barista Express is an attractive model that straddles the line between espresso and true bean-to-cup machines. It has a range of features designed to produce consistently aromatic and tasty coffee, along with a steam wand for milk frothing. We highly recommend this model for coffee enthusiasts. 3.1 What’s the largest cup that fits under the spout? 3.2 What drinks can you make with the Barista Express? 3.3 Is This the Best Sage Coffee Machine? The Sage by Heston Blumenthal the Barista Express is a manual espresso machine that also comes with a built-in burr grinder. 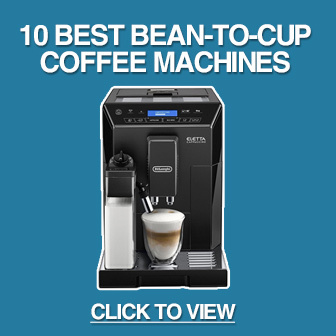 In other words, it’s not a “true” bean-to-cup machine, but has many of the same benefits. It also has an undeniably stylish design, range of coffee customisation options and several accessories. Unlike espresso-only machines, such as the Jura Micro 1, it has a steam pipe to make cappuccino. With an RRP of around £600 it’s certainly a pricey machine. Is it worth the money though? And, most importantly, does it make great coffee? Keep reading our Sage the Barista Express review to find out. The Sage Barista Express isn’t cheap, but it comes with a range of interesting features. The PID temperature control, for example, delivers hot water at just the right temperature for maximum taste extraction. It also has dose control and extensive coffee customisation options. Most importantly, it produces fantastic espresso – although it may take a few tries to hit the sweet spot. As a side note, the Sage is actually made by Breville. It’s just branded as Sage by Heston Blumenthal in the UK. So regardless of your opinions of the man himself, the Barista Express is built by appliance manufacturers who know what they are doing! The Sage by Heston Blumenthal the Barista Express is certainly a coffee machine that stands out. With a design that mimics commercial machines, it’s a “statement” appliance that looks fantastic on a kitchen counter. The build quality also go a long way to justifying the high price tag. As we mentioned, it has a range of interesting features. The PID temperature control allows the machine to pass hot water over coffee at just the right temperature. This is vital for extracting maximum flavour. It also has low pressure pre-infusion for improved taste, along with a built-in filtration system. It’s also relatively quiet once the beans have been ground. Firstly, the Sage Barista Express isn’t a “true” bean-to-cup machine. While it includes an integrated grinder, which is why we’ve included it on this site, you need to grind into the filter and tamp it yourself. This is a drawback if you’d like the coffee making process to be automated. On the other hand, the machine is great if you like complete control over how your coffee tastes. There are 10 different settings for coffee dose, which is more than many other bean-to-cup machines. There are also options for adjusting temperature and it can make one or two cups. Like most bean-to-cup coffee machines, the Barista Express has a built-in burr grinder with 18 different settings for grind coarseness. The average coffee drinker will probably find a coarseness and dose that matches their beans and leave it at that, but there is the option of endless experimentation for enthusiasts. Interestingly, the coffee machine comes with a manual mode for dispensing as much coffee as you want. While there are automatic modes for one or two cups, which can be adjusted in size, the manual option is great for making long drinks. To access this mode, just hold the one cup button. The machine then starts pre-infusion before dispensing, and you can stop it by pressing the button a second time. While having more customisation options is always a good thing, it can take some time to get to grips with. The control panel is relatively clear though and it doesn’t take long to understand all the buttons and settings. If you love your coffee, be prepared to spend some time testing the perfect settings – but the results are worth it! As you would expect from a coffee machine in this price range, the espresso produced by the Sage is excellent. It can make espresso both from ground coffee and beans, although it excels when using fresh beans. It’s slightly let down by its crema according to some reviews, although it does a decent job most of the time. Some buyers would also like it to produce slightly hotter coffee – even on its hottest setting. On the plus side, Sage claims the Barista Express can make espresso from beans in under 60 seconds, so you won’t need to wait long for your coffee. The Barista Express is capable of making frothy cappuccino or latte. A milk jug is provided for this purpose, although the steam can take some time to heat up. This is because a dual boiler isn’t included with the machine. There isn’t an automatic milk frothing function for cappuccino. Instead, a milk frothing pipe is included for manually texturing milk. This pipe is effective and allows you to make tasty cappuccino – but it takes some practice to get right. Once you get the hang of it though, the machine can make perfectly textured milk for cappuccino and latte. The initial setup of the machine might seem quite overwhelming, but it’s relatively straightforward and full instructions are provided in the manual. Like any bean-to-cup coffee machine, it’s important to clean it regularly to keep everything in to working condition. Fortunately, the Barista Express doesn’t require much maintenance. A cleaning filter is included and you’ll also need to descale it every now and then. A pin is provided to clean the steam pipe – just make sure you don’t lose it. The Barista Express includes a cup warmer for pre-warming. There is also the option to dispense hot water directly. This is great for making Americano or long black coffee. There’s no doubt this is an expensive coffee machine. With an RRP of £600 and no automatic function for cappuccino, it’s not aimed at people wanting the occasional cup of black coffee. However, with its range of advanced features, commercial appearance and outstanding espresso, it still provides value compared with other bean-to-cup machines. Coffee enthusiasts will also enjoy the 10 strength settings, as they provide greater control than other machines. A cheaper option is the Duo Temp Pro. 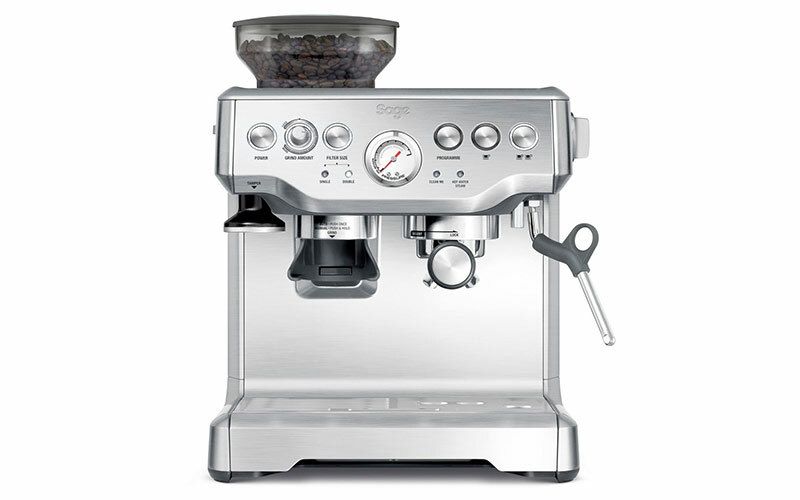 This is also made by Sage and has a lower price, but doesn’t come with a grinder or many of the customisation options included with the Barista Express. What’s the largest cup that fits under the spout? We’ve done some research and it appears the maximum distance between the spout and drip tray is around 10cm. You can fit larger cups than this, but you’ll need to hold them at an angle. What drinks can you make with the Barista Express? While it excels at making espresso, you can make a variety of drinks with the machine. The steam wand allows for latte or cappuccino, although it can take practice to get the milk right. The water dispenser can be used to make Americano, long coffee or even tea. Is This the Best Sage Coffee Machine? The Barista Express isn’t the most expensive Sage coffee machine (the Oracle is much pricier), but we think it’s one of the best for value for money. Click here for more information about other Sage machines though. The Sage by Heston Blumenthal the Barista Express is a relatively expensive espresso machine with added burr grinder. It’s also difficult to use – at least to start with. Once you get the hang of it, however, it can produce excellent espresso that’s tailored precisely to your preferences. It also has a range of features, including the PID temperature control and low pressure pre-infusion, that provide consistent results.